The 2018 Explore Greater Rochester Guide, the official visitor’s guide to Greater Rochester and Monroe County, is now available. 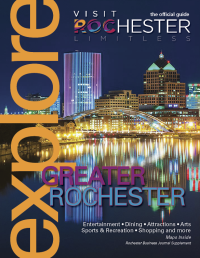 The Explore publication is a partnership between Visit Rochester and the Rochester Business Journal. The 2018 edition of Explore Greater Rochester highlights the best of local events, entertainment, the arts, food and drink, shopping, sports, parks and recreation, museums and more! With so much incredible content to cover, it is no wonder this year’s visitor’s guide contains 100 pages of information and photos highlighting what makes the Greater Rochester region and the Finger Lakes a special place to visit, live and work. Explore Greater Rochester is used as the primary collateral piece shared with prospective visitors who request information on our area, is available at one of more than 200 distribution points throughout the Greater Rochester area, and is distributed to meeting and convention attendees visiting the Greater Rochester area. Explore Greater Rochester is just as great of a resource for local residents as visitors. The guide connects visitors and residents with the hundreds of events, festivals and entertainment options that exist in Rochester. The 2018 visitor’s guide also spotlights the Frederick Douglass Bicentennial, the 120th anniversary of the Rochester Lilac Festival, Rochester as a craft-brewing destination and the ongoing revitalization of downtown Rochester, among other features. Explore Greater Rochester guides are available to visitors at local hotels, area attractions, visitor information centers and the Greater Rochester International Airport. Rochester Business Journal subscribers will also receive a complimentary copy of the guide with the April 13 edition of the paper. The visitor’s guide is available for download online. For more information or to request a visitor’s guide, please contact Visit Rochester a (585) 279-8300 or (800) 677-7282 or visit our website at visitrochester.com.